Major spoilers for "Captain Marvel" ahead, so proceed with caution. Captain Marvel's most closely guarded secret has been revealed: Annette Bening is Mar-Vell. Yes, the four-time Oscar nominee appears as the Supreme Intelligence -- the god-like A.I. comprising the greatest Kree minds of all time -- but she's only one manifestation of it, as the Intelligence takes on the form of the person Carol Danvers most admires. Her true identity is Dr. Wendy Lawson, a scientist and mentor to Carol who is revealed to be the Kree operative, Mar-Vell. 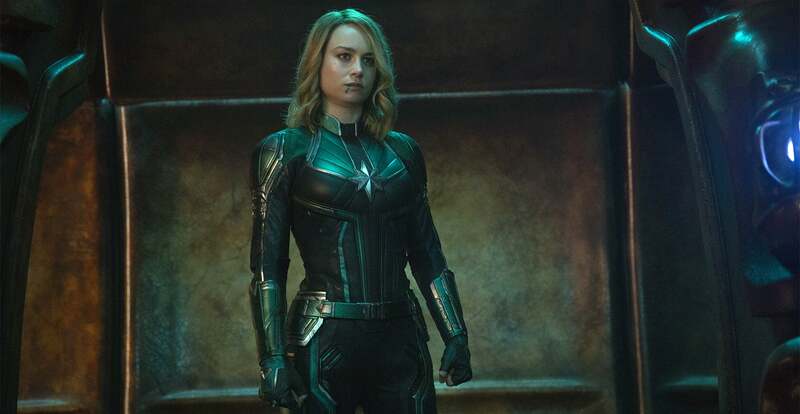 It's a radical departure from Captain Marvel's origin story in the comic books, but one we'd previously been told had been updated "for a modern audience." (Mar-Vell, or Dr. Walter Lawson, is male in the comics and Carol is his love interest.) During the Captain Marvel press day, ET sat down with the architect of the Marvel Cinematic Universe, Kevin Feige, and with the movie now in theaters, I can release our spoiler-filled conversation on Mar-Vell, the film's dedication to Stan Lee, the possibility of a future "Secret Wars" storyline and what's to come in the MCU. ET: I want to start with the Stan Lee tribute at the beginning of the movie. The audience I watched with was very touched by it. When and how did you decide you were going to do that? It was soon after he passed, and we were thinking about what to do and how to do it and whether to release something or put something out online. And we figured, as we always have, the way to pay honor to him is the way we've been trying to do while he was alive, which is the movies. I had always thought in the back of my head, should that day ever come -- which as I've previously said, I wasn't sure it would. Like, I envisioned him at 127 -- that I would want something sort of touching and rousing up front, as opposed to sort of depressing at the end. I know that, not specifically but in general, a celebration is what Stan always wanted as opposed to any sort of mournful event. So, it happened very, very quickly soon after we got the unfortunate news.. We put that together and our visual development department, led by Ryan Meinerding, illustrated all those illustrations of him that you see, before we then go into the clips. Stan's cameos in these movies have always been a fun Easter egg, but now they've become something sentimental. Is this the last one we have of him? Or will we have one in Endgame? And then will we have one in Spider-Man: Far From Home? We'll see. We're heading-- We shot a couple of others, so we're coming up on the last of them, yes. To get into the spoilers of Captain Marvel -- now that we can -- I got goosebumps when the movie revealed [Bening's character is named] Wendy Lawson, and I realized, "Oh, she is Mar-Vell." Yes. Oh, good! We're desperately trying to hide that in the marketing, as Jonathan knows. Not everybody's going to know that name, like you, but yes. Was that an idea from one of the writers, or [writer-directors] Anna Boden and Ryan Fleck, or was that an idea Marvel had before anyone signed onto this? It was late in the development of the movie. Frankly, as we were approaching shooting, we were casting male -- We were looking for a male Mar-Vell and developing the script at the same time, as we often do. We spoke to a few people, but as you've now seen in the movie, it's a limited role, because of the nature of the structure of the story. It was, I believe, Anna who came up with the suggestion in a script meeting that, "Why don't make the S.I., the vision that she sees, Mar-Vell?" The idea was just before we brought Annette on. So, it was relatively late in the development process and one of a handful of things that happened as the script was taking on its final form, that was an epiphany that Anna had, and it was like, "Oh, of course! That's perfect!" And we stopped looking for another actor. Not that you guys couldn't have come to that, too, but it is a wonderful moment of bringing more people to the table, of adding diverse voices and you get these epiphany moments that end up being perfect. Exactly right. There were a number of those by a number of different people, but that one, let's credit Anna, a hundred percent. This story is told amid the Kree-Skrull War, which is a massive event in the comic books. Will we be seeing more of that going forward? Or do you think Captain Marvel has effectively ended it for now, as she set out to do? Well, we don't know what she did, right? She said she was going to and she went flying off at the end, and then we jump many years into the future. What happened in that intervening time, I think, is something that would be a lot of fun to explore at some point. You've also, through this movie, put a radical twist on the mythos of the Skrulls. Should we still hold out hope for a "Secret Invasion" movie? Or would it not make sense at this point? 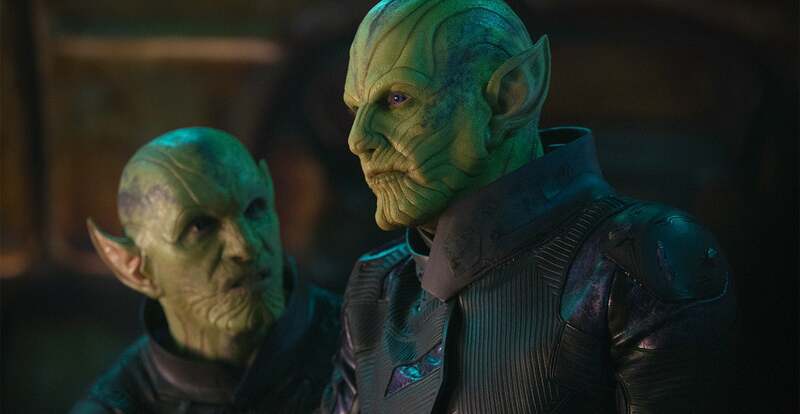 I think like the Kree and like humanity, there are good Skrulls and there are bad Skrulls. But one of the things we wanted to do in this movie is, you know, don't judge a book by its cover and tap into people's preconceived notions of the pointy-eared green aliens being evil and subverting that. But I do think to continue fleshing them out and making them these three dimensional actual beings, the Skrulls, you would encounter good ones and bad ones. This movie ends with Carol going off not into the sunset, but into deep space, leaving this franchise open to continuing in the '90s. And then we jump forward in time for the post-credits scene. Do you have an idea of where you would want a sequel to go, whether to the present day or stay mining this territory of the '90s? Do you have an internal timeline mapped out of from this movie to Iron Man? In a general fashion. The blanks are filled in as we make the movies, and until it solidifies into an actual film, there are multiple branching timelines. With this universe you've created, you've also created a fan base that is as excited about the current movie as the next five coming out. We're at a point now that we haven't been in in a while, where we only know the next two movies, Endgame and Spider-Man. Are you planning on having a big presentation again, to lay out the slate of what's coming after that? You know, we very specifically have been holding back on anything leading up to Endgame, and as connected to that, Far From Home. Because that was our focus, that's where we wanted the focus of the fan base to be on. Once those films are out, I think is when we'll announce what's coming next. How far we'll announce in the future? I'm not sure we'll announce five full years necessarily, although we know five full years. But we'll be making some sort of announcement, yes, and I'll pull back the curtain on what's been in the works. That said, I'm going to name four things I would be very excited to see and you tell me which has been percolating in your mind or which is closest to coming to fruition. The four things I really want are: Kamala Khan in the MCU, a Nova movie, an LGBT superhero or Taika Waititi announcing his next Marvel project. Or? Or "and"? Can't we have all of them? I would love all of them. But which is closest to reality? I think all of those are percolating and-- Let's put it this way: They're all percolating. I do want to keep the focus on this one and on the immediate future, but everything you just named are percolating, some closer than others.